Three Rules of Writing from Distinguished Crime Novelist, Elmore Leonard (and how I broke them) | Beat Up Shaun With Delight! We lost another bestselling author last week. 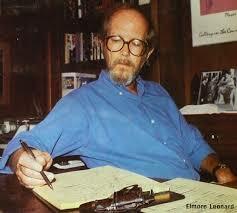 Elmore Leonard, acclaimed crime novelist died. He was 87. Perhaps best known for the 1990 novel “Get Shorty” which was later made into a 1995 Hollywood film starring John Travolta, Leonard defined the crime fiction genre.